Liebherr Container Cranes has recently delivered and commissioned two Super Post Panamax Cranes in Ngqura Container Terminal, South Africa. The terminal is operated by Transnet and these two cranes bring to eight, the total number of Liebherr ship to shore cranes operating in Ngqura Container Terminal. The cranes have an outreach of 52m and the acquisition of these two cranes increases to 27 the number of Liebherr ship to shore cranes operated by Transnet in South Africa. Indeed these cranes are the last of an order of 18 ship to shore cranes placed by Transnet. Six of these cranes are installed at Pier 1 in Durban, 6 in Cape town, 1 at Port Elizabeth and 3 more at Durban South and East Quays. The cranes supplied have a lift height of 37m under spreader with a S.W.L. of 60t under a twin lift spreader. Hoist speeds are 70-175m/min, trolley is 220-240m/min and the crane can travel 37m/min. The drives are Liebherr D.C. and both cranes include the Liebherr Visuscan Crane Management System and operate with the Navis SPARCS N4 terminal operating system. The first Liebherr ship to shore crane commenced operation for Transnet in 2004. Since then Liebherr has worked very closely with Transnet supplying ship to shore cranes that have been an integral part of their continued growth. The acquisition of the Liebherr cranes for the Ngqura Container Terminal will help to meet projected growth in the port’s volume demand. Ngqura Container Terminal has a capacity of over 800,000 TEU’s per annum and is expected to reach a capacity of 1,500,000 TEU’s by 2013/2014 with a forecasted capacity of 2,000,000 TEU’s by 2019. 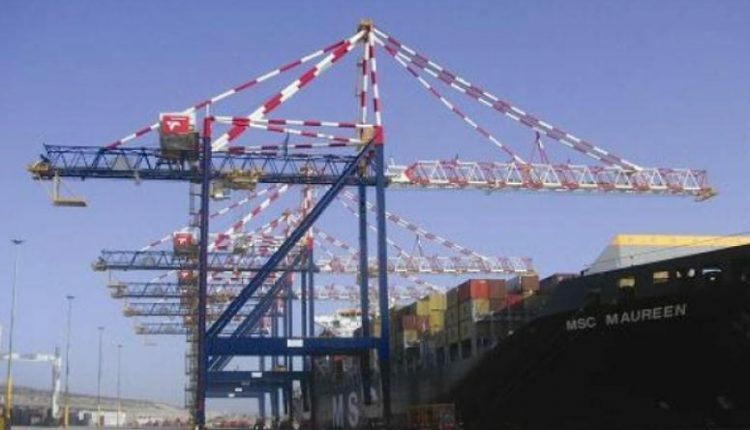 Ngqura Container terminal has a draft alongside of 16.5m which means that in association with the new Liebherr cranes, it will be in a position to handle the largest super post panamax vessels. Liebherr ship to shore cranes’ capacity of handling upwards of 200,000 TEU’s per annum contributes significantly to Ngqura its targets. Ngqura is set to follow in the footsteps of Durban, which is Africa’s busiest port.